Infuse the rejuvenating, rounded scent of wild figs and blackcurrants throughout your home with the Parks Wild Fig, Cassis & Orange Blossom Diffuser. Carrying a delicate, balanced fragrance and presented in an attractive glass oil bottle, this luxury diffuser is the perfect way to enrich your space with bright and optimistic fruit flavours. Wild fig is a rich and potent base note, great for creating a sophisticated ambience in any room of your home. The fig fruit and its scent have been used throughout history, and it’s thought that the philosopher, Plato, used the fruit extensively, believing that it aids concentration and stimulates ideas. Balancing the rich and aromatic fig comes blackcurrant, whose sweet scent helps to elevate the bouquet. This is helped further by the appearance of orange blossom and cassis, two scents renowned for their uplifting and rejuvenating properties. The result is balanced and invigorating, neither too rich or too light, and perfect for bringing a warm, fruity fragrance to a living room, dining room or kitchen. 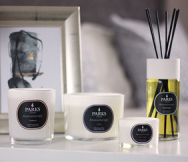 The Wild Fig, Cassis & Orange Blossom Diffuser is exclusive to Parks Aromatherapy, a special collection of delicately-scented home fragrances designed to aid relaxation and wellbeing. The diffuser uses only the finest quality natural scents, and features natural rattan sticks which help to deliver strong fragrance for up to eight weeks. Looking for the perfect gift? All our diffusers and candles are presented in a luxury presentation gift box, so you can give the gift of inspirational fragrance to your friends and loved ones.